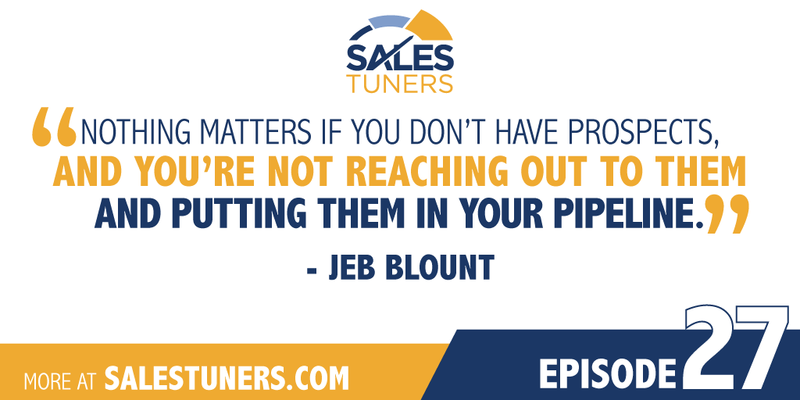 In many ways, the life of Jeb Blount (@SalesGravy) is a salesperson’s dream come true. He is the best-selling author of eight books, including “Fanatical Prospecting,” an advisor to many of the world’s leading organizations and the CEO of the sales acceleration company, Sales Gravy. But he’s worked incredibly hard to accomplish what he has. He is the first to say he is prospecting every day of his life. And if you took everything he’s earned away, if his whole world fell apart for some reason, Jeb said he’s confident that he could prospect himself back to where he is today. How? By utilizing a balanced approach and leaving no door to opportunity unopened, Jeb said anything is possible. What that means for the average person is never to put all your eggs in one basket while you’re prospecting. While social is a valuable tool, it isn’t the only one at your disposal. Phone calling remains a backbone for sales success, in addition to careful use of email and other networking tactics. According to Jeb, prospecting is the bread and butter of any successful sales practice, mixed with an almost-fatal dose of arsenic. Because prospecting is hard. There is no easy button. There is no magic dust. Yet if you believe the power of prospecting and commit wholeheartedly to its practice, it will pay dividends. Protect the Golden Hours: Setting a structure in place for making sales calls has the potential to make or break your business. Make time for what matters, by including blocks of time to make sales calls on your calendar, preferably during the golden hours. Use voicemail blocks to call late in the day when you know you’re not going to reach most people. Plant a seed by leaving a voicemail, but then follow up in an outbound call block the following day. That way, the number is recognized or the call is returned. The same method can be utilized with e-mail as well. It may only take 15 minutes to accomplish something amazingly powerful. Remember the 30-Day Rule: The 30-day rule is a simple formula that comes into play regularly for most B2B salespeople. Generally speaking, any prospecting you do in a 30-day period of time has the tendency to pay off over the next 90 days. Yet this is where the anatomy of a sales slump lays its foundation. This is where a lack of prospecting can lead to no pipeline, which leads to no closed sales. This is where confidence gets shaken. It’s ultimately the decision to stay focused and remember the end game that gets you through. Put the Sales Person Hack to Use: The bane of existence for most salespeople is the gatekeeper. So think about ways to get around them. Instead, leverage your likeness to others like you. Be persistent and talk to someone who understands. Have you ever called on a salesperson in another company? That call is always going to get answered! And guess what? They know your pain. Engage with them. Tell them what happened when their gatekeeper told you no. Why? Because they’ll get it. And they’ll get you where you need to be.